Background Smoking is a serious public health problem. Patients with schizophrenia usually have a higher prevalence of smoking than the general population, but the level of nicotine dependence is seldom studied, especially for patients living in the communities. Aims This study aimed to examine the level of nicotine dependence in Chinese community-dwelling patients with schizophrenia and explored its associated sociodemographic and clinical factors. Methods A total of 621 patients with schizophrenia treated in the primary care centres of Guangzhou were consecutively recruited. The level of nicotine dependence was assessed with the Chinese version of the Fagerström Test for Nicotine Dependence (FTND). Results 148 patients with schizophrenia were current smokers, and the mean (SD) score of FTND was 5.06 (2.55) for all the current smokers. The prevalence of nicotine addiction was 48.0% (95% CI: 40.0%-56.0%) in patients with current smoking. The patients with schizophrenia had a significantly higher level of nicotine dependence than the Chinese general population. Multiple linear regression analysis revealed that male gender, being unemployed, having a family history of psychiatric disorders, having major medical conditions, first illness episode and less severe positive symptoms were significantly associated with a higher level of nicotine dependence. Conclusion Community-dwelling patients with schizophrenia in China, especially male patients, had a higher level of nicotine dependence than the general population. Almost all the studies have focused on the prevalence of smoking in patients with schizophrenia8–10 rather than nicotine dependence. Nicotine dependence is an important issue associated with cardiovascular and respiratory diseases.1 Thus, understanding the pattern of nicotine dependence and its associated clinical factors are important to help develop appropriate policy and intervention developments for controlling the risks associated with smoking. The aims of the current analysis were to study nicotine dependence level in community-dwelling patients with schizophrenia in China and to explore its independent sociodemographic and clinical correlates. 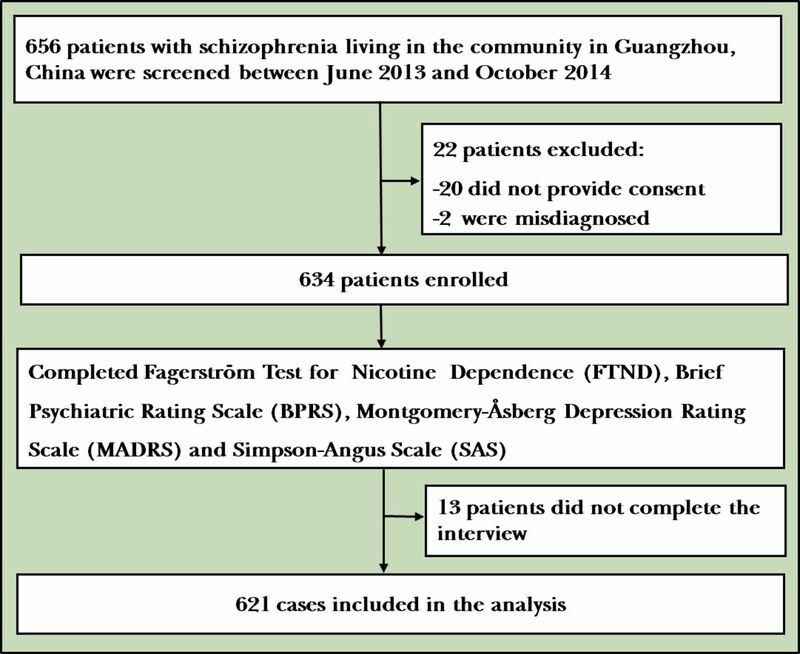 This study was a secondary analysis of the data based on a survey conducted between June 2013 and October 2014 to investigate the prevalence of smoking in community-dwelling patients with schizophrenia in Guangzhou, China.11 Inclusion criteria were: (1) diagnosed with schizophrenia according to the International Classification of Diseases, version 10 by a review of medical records and confirmed in a clinical interview using the Chinese version of the Mini International Neuropsychiatric Interview (M.I.N.I. ), V.5.0;12 (2) aged 18 years or older; (3) in a stable condition; (4) receiving treatment in primary care centres and (5) having the ability to comprehend the content of the interview. The recruitment was as follows: of the 92 primary care centres in Guangzhou, 22 were randomly selected; the patients with schizophrenia in the selected centres were consecutively screened. In the 656 patients that were screened, 22 did not meet the study criteria and were excluded, and 13 failed to complete the interview. In the end, 621 were included in the analysis (see figure 1). The study protocol was approved by the Joint Research and Ethics Committee of the Chinese University of Hong Kong-New Territories East Cluster. Written informed consent was obtained from each patient. Psychotic symptoms were assessed with the Chinese version of the Brief Psychiatric Rating Scale (BPRS).17 The three factors of the BPRS were used: positive (conceptual disorganisation, suspiciousness, hallucinatory behaviour and unusual thought content); negative (emotional withdrawal, motor retardation, blunted affects and disorientation)18; and anxiety and tension.19 Depressive symptoms were assessed using the Chinese version of the Montgomery-Åsberg Depression Rating Scale.20 21 Extrapyramidal side effects were assessed using the Simpson-Angus Scale.22 Following other studies,23 three types of insomnia were measured in this study, including difficulties initiating sleep, difficulties maintaining sleep and early morning awakening. In this study, patients reporting any type of insomnia were defined as ‘having insomnia’. Three psychiatrists with more than 5 years of clinical or research experience interviewed the patients. Prior to the main study, an intrarater reliability exercise on the use of the questionnaires mentioned above was conducted in 10 patients with schizophrenia and a satisfactory agreement was achieved (>0.90). Data analyses were performed using SPSS V.20.0. The comparisons of nicotine dependence between the patients with schizophrenia and Chinese general population were conducted using the one sample t-test or χ² test, as appropriate. Multiple linear regression analysis was used to examine the independent demographic and clinical correlates of nicotine dependence. The level of significance was set at 0.05 (two-tailed). A total of 656 community-dwelling patients with schizophrenia were screened and 621 patients were included, giving a participation rate of 94.7%. Of the whole sample, 148 were current smokers, all of whom were included in this study. Table 1 shows the basic demographic and clinical characteristics of the current smokers. The mean (SD) of FTND score was 5.06 (2.55) for the current smokers (male: 5.14 (2.53) vs female: 3.57 (2.63)). Compared with the Chinese general population,16 patients with schizophrenia, more specifically in males, had a significantly higher level of nicotine dependence (table 2). Multiple linear regression analysis revealed that male gender, unemployed status, having a family history of psychiatric disorders, having major medical conditions, first illness episode and less severe positive symptoms were significantly associated with a higher level of nicotine dependence (table 4). Male patients with schizophrenia were more likely to have a high level of nicotine dependence, which is consistent with previous findings.5 26 27 In East Asia, including China, strong cultural and social pressure together with traditional factors may contribute to a considerably lower smoking rate among the female population. Unemployed patients were more likely to have high level of nicotine dependence, which could be explained by their tendency to be inactive and thus use heavy smoking as a behavioural filler. We found that patients with schizophrenia with a high level of nicotine dependence were more likely to have a family history of psychiatric disorders, suggesting that genetic factors associated with psychiatric disorders may play a role in nicotine dependence. For instance, it has been reported that DA receptor and transporter genes related to nicotine metabolism were also associated with the pathogenesis of schizophrenia.28 Smoking could induce various smoking-related diseases, such as cardiovascular diseases, respiratory diseases, cancers, and so forth. These finding may contribute to the association of high level of nicotine dependence with major medical conditions. First-episode illness was significantly associated with a high level of nicotine dependence, which has not been described previously. It is postulated that first-episode patients with schizophrenia may be lacking coping skills and may be more vulnerable to anxiety and smoking habit, leading to high level of nicotine dependence. Indeed, it has been reported that smoking could alleviate the severity of depressive and anxiety symptoms.29 30 We also found that patients with less severe positive symptoms were more likely to have a higher level of nicotine dependence in contrast to some previous studies.24 Higher level of nicotine might reduce negative symptoms but not positive symptoms; however, the results were inconsistent. The correlation between nicotine and psychotic symptoms is recommended to be further studied. There are several limitations in this study. This is a cross-sectional study, thus the causality between nicotine dependence and other variables could not be ascertained. Nicotine dependence was assessed using a subjective scale, rather than any objective index. The patients were recruited in just one large city and only urban patients were included, therefore the findings cannot be generalised to other areas in China. Finally, the sample size was not large enough, especially for the female patients. In conclusion, the community-dwelling patients with schizophrenia in China had a higher level of nicotine dependence than the general population. Appropriate interventions on smoking control should be developed for the community-dwelling patients with schizophrenia, especially for those who are male, unemployed, having a family history of psychiatric disorders, having major medical conditions, the first episode and experiencing less severe positive symptoms.
. Cigarette smoking among persons with schizophrenia or bipolar disorder in routine clinical settings, 1999-2011. Psychiatr Serv 2013;64:44–50.
. The Mini-International neuropsychiatric interview (M.I.N.I. ): the development and validation of a structured diagnostic psychiatric interview for DSM-IV and ICD-10. J Clin Psychiatry 1998;59(Suppl 20):22–33.
. The study on the addiction of smoking behavior in urban residents (Master's thesis). Department of Social Medical and Health Management, College of Public Administration, Zhejiang University, 2008.
. The application of translated Brief Psychiatric Rating Scale (BPRS) (1) reliability test (in Chinese). Chinese Journal of Nervous and Mental Diseases 1983;9:76–80.
. Prevalence and correlates of insomnia and its impact on quality of life in Chinese schizophrenia patients. Sleep 2009;32:105–9.
. Nicotinic mechanisms in the treatment of psychotic disorders: a focus on the α7 nicotinic receptor. Handb Exp Pharmacol 2012;213:211–32. Yan Li obtained her bachelor’s degree from Chengde Medical College in 2008, master’s degree from the Capital Medical University in 2011, and PhD degree from the Chinese University of Hong Kong in 2016. She has started to work at the Beijing Anding Hospital, Capital Medical University since 2016. She is currently working as a resident doctor in ward 11 at the Depression Treatment Center. Her research interests include meta-analysis of psychiatry research and clinical studies of mood disorder. YL, C-LH, X-RM and YZ contributed equally. Contributors Study design: YL, Y-TX. Data collection and analyses: YL, C-LH, X-RM, YZ, M-YC. Drafting the manuscript: YL, F-JJ, KYCL, Y-TX. Critical revision: GSU, CHN. Approval of the manuscript: all authors.